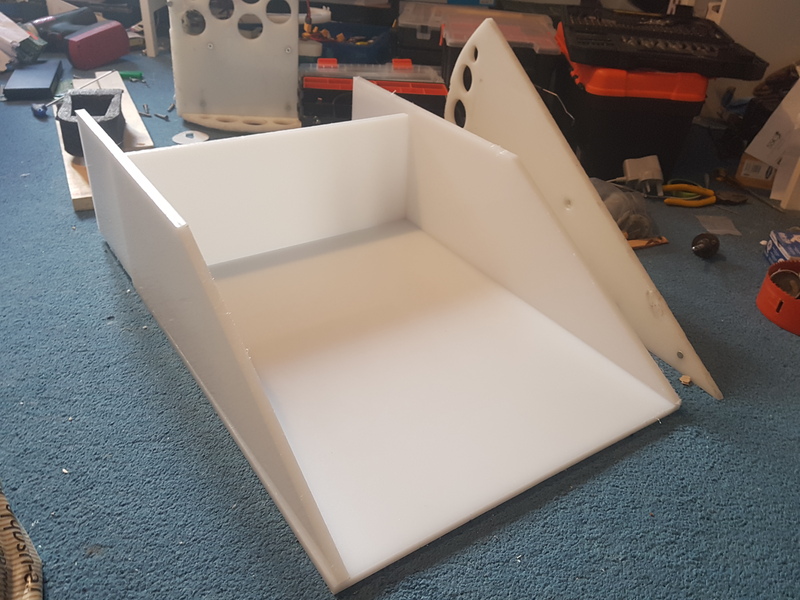 So Robodojo January 2019 has come and went, and was a fantastic event overall, but before I get into the fights I'd just like to get into some of the repairs that had to be made between Insomnia and Robodojo. First of all was needing to get a new green top cut for the bot afting using up my spares at KOB UK, nothing too fancy needed there (at this point, I've accepted I'll be going through one of these per event if spinners are involved). 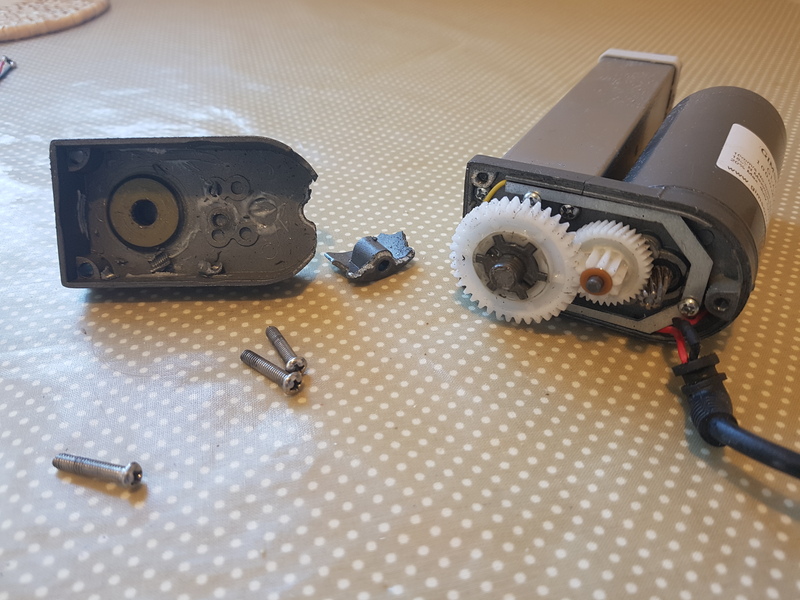 Second of all was repairing my broken linear actuator; when testing the linac for the first time months after KOB UK it seems a bolt came loose within and ruined two of the nylon gears within. Fortunately Gimson Robotics sent over some replacements free of charge upon contacting them, so all it took was some reassembly and some loctite for insurance and I was good to go. The horizontal configuration for the machine was also prepared: I knew Telekenisis would be there, and wouldn't want to chance facing them without it. A shot of the busted gears in the linac. fortunately the pieces were easily replaced. Getting to the event was far more comfortable than previous excursions to the UK. By going to Liverpool over Holyhead, the drive to the event was not only shorter, but due to the increased length of the cruise we were actually able to sleep on the way. We ended up being one of the first teams to arrive, and ended up sharing the same table with Colin and No Imagination and Chimera's Revenge, and Alice and Tantrum. The machine was given some last minute touches, and was at 100% health going into the main tournament. A shot of Barróg, probably the best it'll ever look. The format had been announced a few days before the tournament. Both the Sportsman and Full Combat contestants would take part in four 1v1s with other machines in the bracket, drawn at random. For the first round I was drawn up against Mark Smith's Forge Master, an axe-bot that made it to the top 20 at last years Insomnia. I knew it was a sturdy bot with a lot of experience of driving for the short time it's been active, and that weapon could cause cracks in the HDPE if it hit the right spots. I knew it would be a control match over all else, and those hinged forks would beat the HDPE wedgelets in head-on collisions, so I opted to use the 1.5mm stainless steel wedge instead. I loaded up the bot and got ready to fight. Forge Master seemed to be having issues with the axe beforehand, so believing it wasn't working, he just left the cover for the axehead on. Eventually the axe seemed to work later on, throwing the head off eventually. The metal wedge performed beyond my expectations in this fight, and seemed to take priority over the forks more often than not. I'm crediting this to having more weight on the end. As someone who's seriously looking into the idea of hinged forks, this something I'm keeping in mind for the future. Eventually I corner Forge Master and get a really good grab on them. For the first time in what feels like forever, the weapon is working as I originally intended, grabbing tightly, and allowing me to drive with them on top. Unfortunately, the pit ended up not working for this fight due to damage, so I was unable to get the pitting I was hoping for and end up having to let go shortly after. From this point the fight is mostly just a back and forth shoving match with me possibly having the slight edge due to size. Eventually though Forge Master takes a thwack that seems to kill the receiver. It seems that earlier problems with the bot could also be attributed to this malfunctioning part. It's always good to start off a competition with a win, and thankfully the machine seemed almost unharmed. One corner of the steel wedge was slightly bent, but easily fixed, and there was a small crack on one side of the chopping board near the lifter, but with none of that looking to be too bad I just swapped out my batteries for the next fight. For the second round I was dealt a far deadlier opponent, Cosmin Gorgovan's X-303. 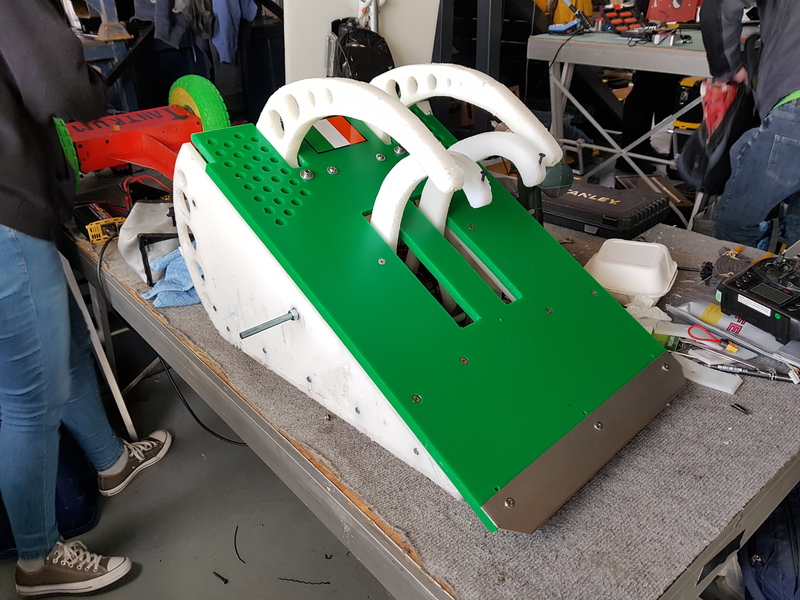 This drum bot had come off a relatively disappointing performance at KOB UK to go on undefeated and win Dutch Robot Games 2018, so the bot was no joke. I didn't really have any configurations planned against drum bots, my only prior experience was with Drumroll at XR Manchester 2018, so reasoning off the fact that the plastic wedgelets would be torn up and the horizontal configuration would just give him something nice to bite onto, I opted for the steel wedge and went in with a strategy to finish the fight as quickly as possible. Fairly happy with how quickly I was on X-303 at the beginning, my style of trying to stay in the face of spinners as much as possible left little room for the drum to get a truly good hit in at the start. While trying to correct my driving, I end up oversteering a little too much, which reveals the back of the bot to X-303 for just a second, which is just enough time for it to get that perfect hit and send me packing out of the arena for the first time ever. At least it's hard evidence for my weight theories though! A very exciting fight for basically only being 30 seconds long, and in retrospect it was probably good the bot got off with that little damage, things could have certainly been a lot worse had the fight gone on longer. 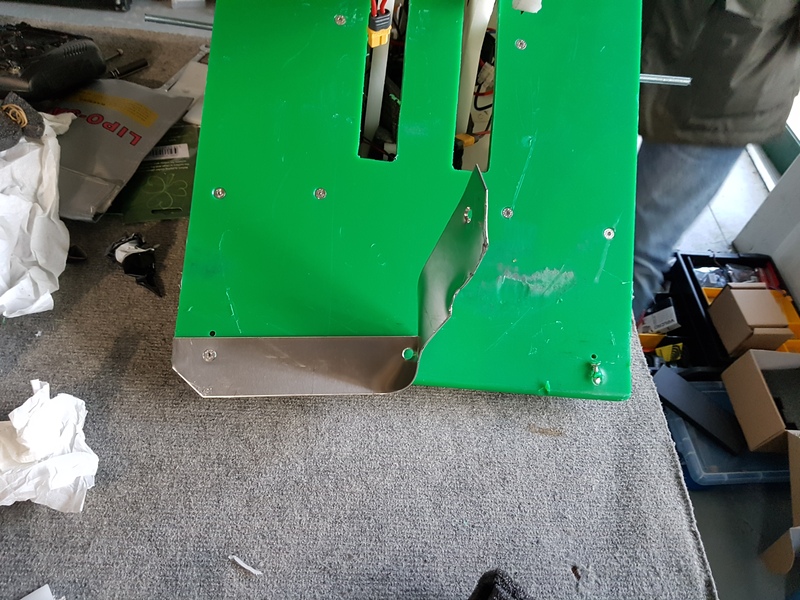 The metal wedge up front was at a 90 degree angle and messed up (a good gift for Cosmin at least), but other than that no major damage, which was a relief as all I'd need to do is some TLC for the green front and charge some batteries and I was good to go for the next fight. A shot of the wedge post-X-303. The left holding bolt seemed to almost be fused with the plastic, so it took a bit of fiddling to get it out. The back of the bot where it was hit. Though it isn't very clear, there's a clear concave mark left in the back where the drum made contact. No damage to the securing bolt or the linac though, which was surprising. Last edited by Shooty; 5th February 2019 at 17:25. My third fight was against Sam Graham's PIP (Pretty In Pink), a vert at its first event, and I believe the first event Sam had competed at as well. The weapon was certainly scary, but I knew from previous fights that the bot wasn't the most controlled, and once I heard he was removing the front wedgelets due to driving issues, I knew that so long as my front was facing his, the weapon shouldn't ever make contact. We prepared the plastic wedgelets as was the given vert strategy at this time, and entered the arena. My hope for the fight was to get in under PIP and grab him right down the middle, keeping my claws safe and granting me full control for a pitting. It seemed though that I'd need some speed to get under him fully. After some failed attempts I had PIP in a position where I thought I'd have a perfect grab, only to find out that I was just a little short. As it turns out though this meant the lifter could keep going up, and due to PIP's drive issues and Barróg's height, I realised I was in a position to score an OotA. At this point PIP tried spinning up and driving around the front piece, eventually chewing into my lifter claws, while I tried shaking him off. At this point the arena marshalls started to get nervous, as PIP leaving the arena in this state could pose a safety risk. In hindsight I should have gone for a different wall for the OotA, but at this point I just had my blinkers on and did not want this fight to go on any longer. Eventually PIP is told to spin down, and a few bumps later and the bot finally slipped off over the arena walls. Certainly not a way I had ever intended to take a win, but I was always happy to have taken down another vert. Damage wise the bot had actually taken a surprising amount; my left front claw had snapped at one of the joints from an earlier hit, the right spine took quite an amount of cosmetic damage from the spinner, and for some reason the fuse for the left side ESC had blown. The last one was the most confusing, but nonetheless I replaced the claw and fuse, and got ready for my final fight. The right side spine after what seems to have been a trip to the hairstylists. The final fight for me was at some point going to be against Get Shrekt, but over the event the Round 4 draws were redone, and I was due to fight against Will Owen's Graffiti. The stylish linac lifter had been doing decently at the event so far, and was currently 2-1, same as me, owing to some impressive driving. I decided to keep the plastic wedgelets to test them, as I'd never really used them against another wedge before. From the start, it became apparent that his wedge was far more effective than mine, owing I'd imagine to the increased weight on it and the damage the wedgelets take over time. This put me at a disadvantage, further increased by Graffiti's excellent driving. Eventually at 40 seconds in I get a lucky grab and can once again do what the bot was always intended to do, bring an opponent to the pit. Barróg has "worked" more here than at all the other events I've been to combined! Unfortunately, thanks to some sloppy driving and fortunate weight distribution on Graffiti, the bot barely escapes out of the pit, and after one more failed grabbing attempt from me I've basically scuppered my last chance. The rest of the fight is a combination of me desperately trying to get around Graffiti and avoiding the pit. While I'm satisfied in my driving skill to avoid the pit in an arena that small for the full 3 minutes, ultimately I'm still constantly getting pushed around, and it goes to the judges. So unsurprisingly the fight goes to Graffiti, which was absolutely well deserved. No damage was sustained minus some messed up plastic wedgelets. Barróg finished the tournament with a respectable 2-2 record, but I was here for data and fights over glory, and so while I was at the competition, I wanted to get in as many fights as I could, which led to my final whiteboard fight held after the main competition. Binky, the vert that had dealt the most damage to me over the bots life, was at the show, but was a reserve. As it had not fought yet and I was hungry for more data, I offered a whiteboard match to the Botwrights, which they agreed upon. 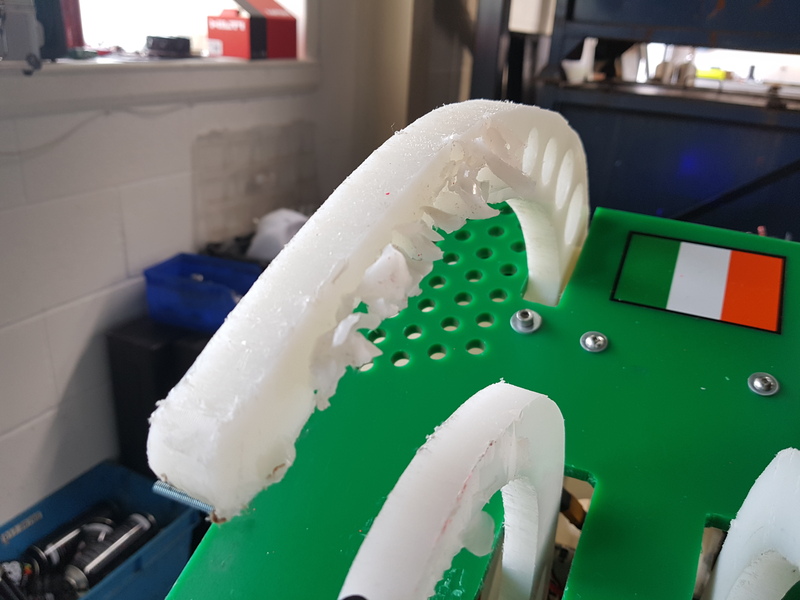 Usually I would use the HDPE wedgelets against verts, but after my confidence was shaken in them a little after the last fight, I decided to switch over to the metal wedge as I knew from Manchester that it could get under Binky, plus now I could properly test it against a vert in a 1v1. I got a nice grab on Binky earlier in, being able to use the bots weapon issues to its advantage. Unfortunately I overestimated the strength I'd need for a good grab, and all pressure from those good grabs earlier on in the competition had accumulated to causing the front to just snap. At least I was able to keep my grip on the bot, and managed to drive it into the pit, unfortunately slipping in a little myself. As it was a whiteboard though the pit was brought up again and the fight was allowed to continue. The next minute was me just trying to outmanoeuvre Binky, taking a few token blows along the way but for the most part surviving. The metal wedge is still doing good so far. Unfortunately at the two minute mark Binky gets a hit on the wedge, and the full force of the impact travels up the bot, ripping the wedge off, ripping the linac out, and leaving me stranded and left for dead. Fun to watch frame by frame though! So that fight was certainly fun, and I don't feel any shame in losing at that point after all I'd done earlier, but man that was the most violent hit the machine has received yet. 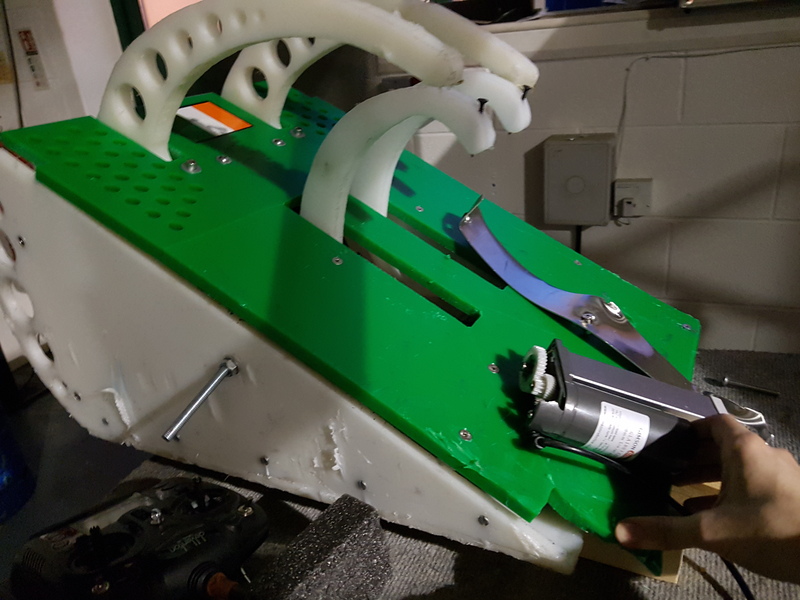 The wedge was somehow bent in four directions, the green piece was now three individual green pieces held together by bolts, the casing for the linac gearbox was broken in so many places, and due to it being ripped out the power wires for the right side drive were all disconnected. I believe that the linac was ripped out mainly due to how instead of the green piece breaking off in chunks upon nasty hits, getting hit dead centre in the wedge transferred far more of the energy upwards, causing the casing break. The machine was done for today, but as it was near the end of the day that doesn't matter too much to me, and hey, at least the match was entertaining! The linac after the Binky fight. Gimson have informed me that they can repair this, which was a relief to hear as this model is discontinued! Last edited by Shooty; 5th February 2019 at 17:24. For another event, I haven't had a single wheel or gearbox break, which I'm happy with given how much the machine was tossed around this time round. Some of the wheels are more cracked than they were before the event, but given how much trouble I had removing a "damaged, weakened" wheel at KOB UK, I'm running these until they break. My current drive system then is still powerful, cheap, relatively lightweight, and very easy to replace, which is a dream for me after issues at earlier events. Steel Wedge: Drums, Wedges, Axes, etc. Drums are probably still the largest guess for me, but I may have plans for them in the future, and hey, at least I can still do decently against verts, which to me is the greatest success of Barróg. Despite beating Forge Master's forks, I do think that having metal hinged forks would be sensible for Barróg Doom, possibly jutting out from underneath the front and with some downforce on them. After some conversations from other builders, I'm fairly certain the HDPE chopping boards I've been using have actually been LDPE, or at the very least a recycled, weaker version of HDPE. While this should be bad, the shattering nature of the boards may have left me in a better position against some of the verts than proper HDPE would. I'm definitely debating whether I should switch for Barróg Doom or stay with what I have already. It was nice to finally have my weapon validated in its effectiveness! Practice and small improvements would be needed to avoid all the self-destruction the machine inflicts upon itself, but hey, small steps. Still switching to the new lifter setup however. 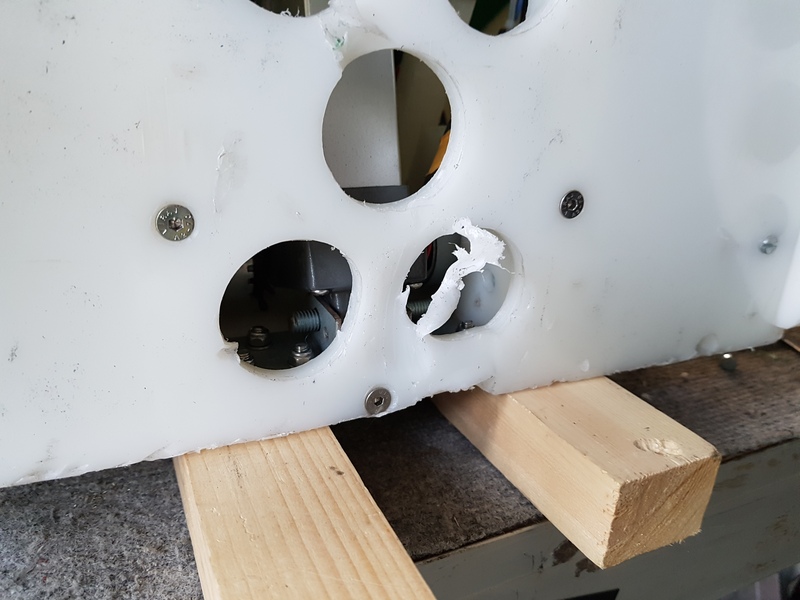 One reason the green front may have broken is because the lifter bracket spacers weren't being used, which meant that almost all of the forces exerted by the linac were going to the chopping board instead of the lifter spines. Some spacers or a modified lifter bracket could go some way to avert this, which I may use for Robo Riots Dublin which should be happening this coming June. Robodojo was great fun, and I learned a lot that should be very useful for the coming build. An Irish competition to replace Mechatrons for 2019 was announced a few days ago, and I intend to have Barróg Doom up and running for the show, though I'll probably bring the original Barróg regardless. Cheers to everyone who was at Robodojo, I hope to be back in the UK soon! Great writeup of the event and well done on your performance. Seems like your weapon takes a lot of finesse to make it effective and it was great to see it work (and then sad to see it destroyed...). That's great that Gimson can fix the linacc, you don't hear of companies repairing small items like that very often (I once tried to buy a spare part for a £20 food processor and the cheapest I could find it was £25... ). I was wondering if the chopping board might benefit from some reinforcement, perhaps some ribs/stringers running along the underside? That should make it less likely to start drooping if/when the weaker plastic gets damaged. So this quick update is mostly to ask about gears, sprockets, and how to mount them, but first, an update on the new machine. Barróg Doom should be constructed a lot quicker than the original, with the base, back and sides being cut in the 30 minutes I had free last weekend to work on it. A shot of the new walls, placed next to one of the old ones to give a sense of scale. My main question to all of the builders on the forum is on the matter of mounting sprockets, gears and axles. I've purchased all of the relevant gears and sprockets off of Beltingonline.com, but I was hoping to ask for advice on how to mount them. I'm planning to use 10mm rods for all but the largest gear, which I was going to use a 25mm steel pipe similar to Giles Ruscoe's Mantis. 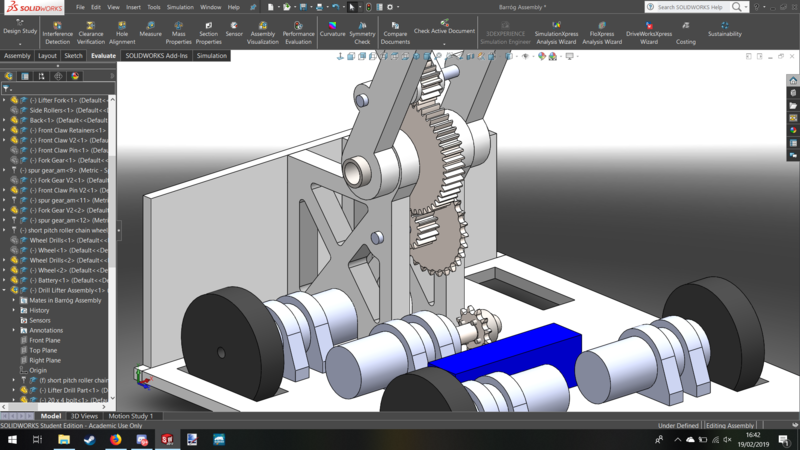 What are common ways to mount these gears to the axles, and how to mount the axles to the bulkheads? 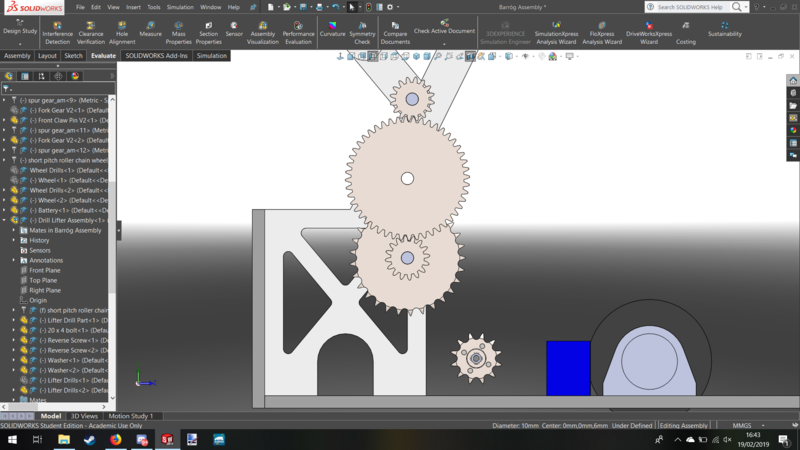 What steps can I take to avoid the gears from misaligning? Should I use bearings and, if so, what kind? What would be the recommended way to machine these parts to minimize loss in strength while improving weight efficiency? Should I use the 10mm rods, or go up, or even down? Any help people can chip in with this would be much appreciated, thanks in advance. The parts in the flesh. Definitely bulkier than they need to be, but it's in how much should be shaved off that I don't know. All of the parts seen from an angle. I'm thinking securing the sprocket to the small gear may be good, though space would need to be left of course for the chain. A side on view of the transmission system. 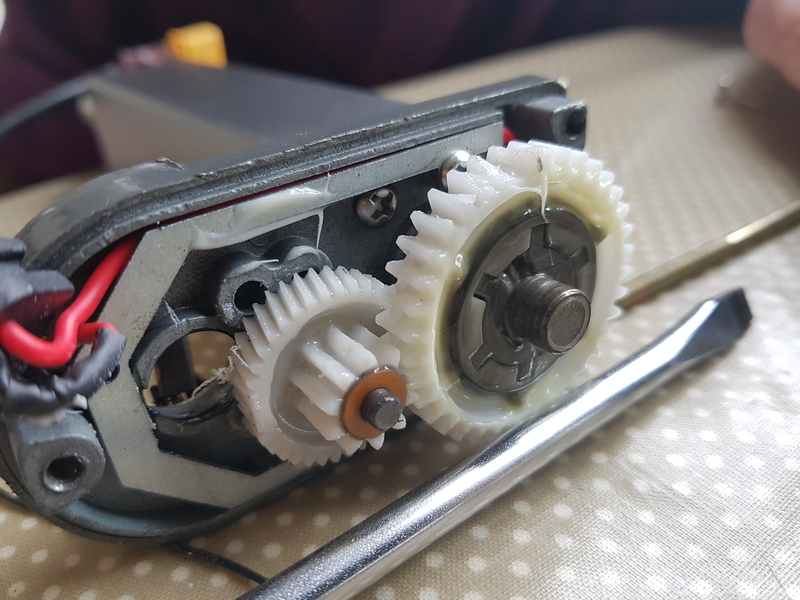 What are common ways to mount these gears to the axles, and how to mount the axles to the bulkheads? What steps can I take to avoid the gears from misaligning? Should I use bearings and, if so, what kind? There are two kinds of shafts. There is a dead shaft, where the shaft is static and the gear slips around the shaft or has bearings inside the shaft to allow it to roll and then there is a live shaft, where the shaft is mounted by bearings on either end and the gear is fixed to the shaft. In Kaizen and Jibril, the axe is a dead shaft but in Jibril's drive system, it is a live shaft. The material that the shaft is mounted in is important too. HDPE deforms way too easily (though I will confess, Kaizen's axe was a dead shaft in HDPE with a cap on one end to prevent it falling out). The gears I have come with grub screws in them which I drill a indentation into the shaft and then threadlock them in. If yours haven't, I suspect welding it would be the best option. Given your design, I would go for a live shaft for your first stage, mounted on flange bearings (https://www.gearsandsprockets.co.uk/...lock-bearings/ for example) and then perhaps a dead shaft for your final stage to the arm but, weight allowing, pillow bearings might work here. What would be the recommended way to machine these parts to minimize loss in strength while improving weight efficiency? Should I use the 10mm rods, or go up, or even down? 10mm rods are OK in my opinion, depending on what it is made out of. 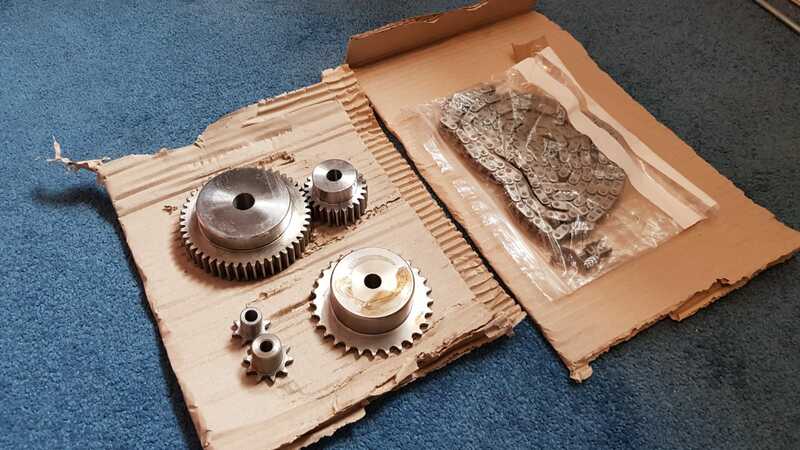 I would have said a lathe to remove some of the bulk from the gear hubs would have been the way to go on losing weight. Always make a cardboard or wooden template first and its a case of just being precise with your markings. Noting I have never done a chain drive, the sprocket and chain needs to be perfectly aligned so I would mount your motor with the sprocket on first, measure from the edges of your robot as to where the sprocket is horizontally and then mount your second sprocket on the subframe to line up with the depth of your first sprocket. So if, after being mounted, the motor sprocket, from the far left edge of your robot, is say 280mm in, the second sprocket also needs to be 280mm in. I am sure others who have done a chain drive before can advise further. Last edited by Ocracoke; 20th February 2019 at 13:55. I was wondering if could be worth you putting in some kind of direct solid connection between the motors and driven sprocket to keep them aligned? As it is, you're going from the driven sprocket, down the mounting bracket, then along the base to the motor (potentially also having to measure out to the edge then back to the motor). It seems like there's a lot of room for measuring/marking errors, and for things to flex in operation, which could leave you with misalignment and derailed chain, one way or another. A bracket that goes straight from the motors to the first driven shaft would give you a nice direct load path and minimal scope for error in manufacture. Might even be worth moving all the motor mounts onto the weapon bracket for the same reason. I'm loving the new design - it's really clever bit of mechanics to double up the lifter/grabber function. Looking forward to some more updates! I spare weight by drilling holes in the gears, if they don`t turn as fast as a couple of rpm it should not be a problem. You have to leave a couple of mm material around the holes.